Many of our interior designer clients just got back from attending High Point Market, the largest wholesale furniture market in North America. I also attend this market, and just like they do, I enjoy seeing what’s new and exciting in the world of home furnishings, lighting and decorative accessories! Today’s post is just going to be a VERY QUICK visual recap of a few of my own favorite pieces… a little bit of eye candy! I will not be sharing any vendor information, save that of our client, Seasonal Living, but if you’re an interior designer reading this, and want that information, please click the link below to Request To Join my Facebook Group: #DesignWealth, and I will be happy to give it to you there. For all the details on what was new at High Point Market, please read the posts of all the interior designers who were there, most of whom you will find on Instagram, by searching the tag: #luxuryinteriordesigner and then cross referencing that with the Instagram tags #HPMkt and #DesignOnHPMkt. And if you want to buy any of the pieces you see in my post today, please click on this link, http://savourpartnership.com/clients to hire one of our wonderful interior designer clients to help you. 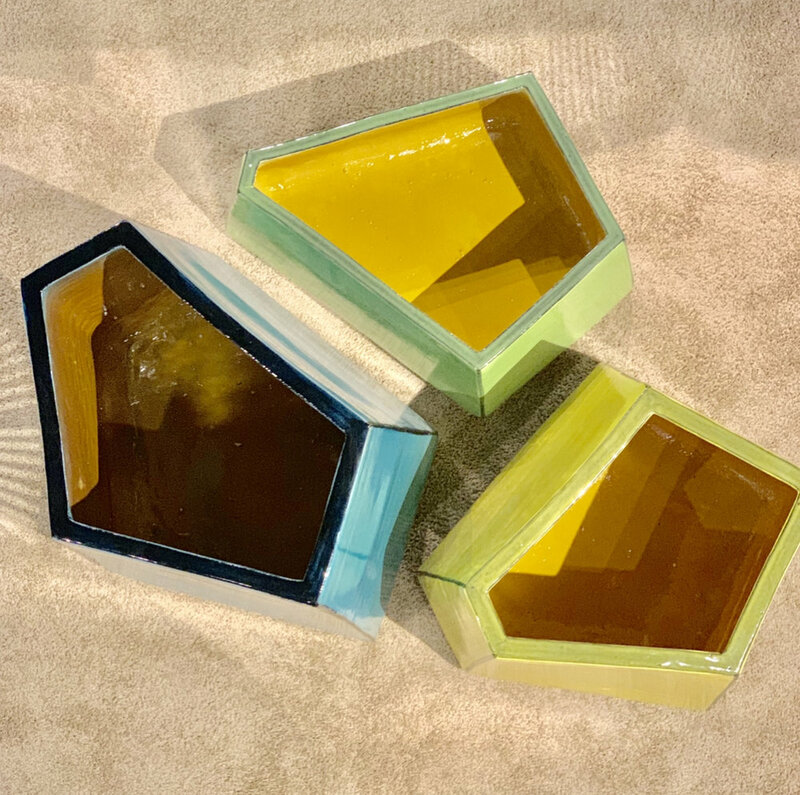 This obliquely shaped indoor/outdoor double glazed indoor ceramic planter from our client, Seasonal Living Trading Company, who showed in Interhall 310, was, even though they are our client, my #1 favorite item of all I saw at #HPMkt. The shapes, the colors, the texture, the utility of these planters is everything I love. As anyone who knows me knows, I have two cats who have managed, collectively, to shred my upholstery. I have hesitated to buy any new upholstery because I’m afraid they will re-shred it and I travel so much that I cannot keep them off of my sofa. (I also refuse to have them declawed). So, when I met the woman who sells these textiles in Suites at Market Square ( and who also provides these textiles to Verellen ), I was smitten the minute she told me ( without any prompting from me) that her cats have not been able to shred them or leave a single mark on them. These are stonewashed canvas and they have a beautiful hand to them, come in multiples of colors and neutrals and come in two weights. In addition, the pricing was reasonable. For interior designer friends reading this: I have had genuine trademarked Ultrasuede HP on a sofa before, and even though the cats could not shred it, they could and did leave scratch marks that were impossible to get out. This same company had pillows that were full of fabulous small details like this orange zipper sewn into beige linen. Notice the beautiful small, even stitching. Gorgeous quality. And even though her fabrics are sourced in India, we had a long conversation about child labor, and I was very, very impressed about how thoroughly she had vetted her factory to make sure that her supplier was not using child labor. This accessory line was showing at #HPMkt for the first time. They were exquisite! The texture is matte, not glazed, and they were so well priced. I happen to know that my good friend, Jeanne Choe Chung, the owner of Cozy. Stylish. Chic. in Pasadena, CA, fell in love with them, too, and bought them for her shop, so if you’re a homeowner reading this and need a retailer to buy them from… call Jeanne at 626-714-7040. I loved them so much, in fact, that I called (right from their space at SAMS) my good friend and local client, Patricia Donham, the owner of Upper Bay Frame and Gallery in League City, TX to encourage her to get their catalog immediately and purchase some for her shop. My little stationery shop, #DesignHappyLiving, lives inside Patricia’s shop. I also called my former client and now good pal, Janis Reed of Rochester, NY based, www.janisreedinteriors.com, who just opened up a new retail store there in Webster, New York , to encourage her to do the same. All of their items were available in both the blue colorway shown above and the tobacco brown colorway shown below. So textural: perfect for bookcase styling! As everyone who was also there saw, animals of all kinds were a key motif in almost every showroom and this animal print chenille fabric was my personal favorite. I saw it used on a chair, and it lent such a sense of dynamism and movement to the room it was within. The woman who is responsible for fabric to frame selection in this showroom is in her 80’s (!!) and an industry legend… and that’s one more reason to love this. She always amazes me with how well she can see in her mind’s eye how something will look, given how many fabrics she views every season. This was also a new vendor showing at #HPMkt for the first time. The form of this chair took my breath away. Someone asked me if it was comfortable, and the truth is, I didn’t personally sit in it. However, I did hear from my friend Robin Baron that she has specified it for clients who weigh 200 pounds, and they love it and find it very comfortable. You might now be wondering about the opening image, and that, too, was a favorite find. I had gotten an email about the introduction of that line prior to #HPMkt, and had shared it on my personal Facebook feed before market. It was so pretty in the email image, BUT I could not tell if the quality matched the picture until I saw it in person. I’m here to tell you…yes, the quality matched the picture. This is a frequent problem, by the way…..the image of something being so beautiful when you see it online, and the quality not matching the photography, when you see it in person. For any of you who have ever ordered furniture online from a beautifully produced website, only to be disappointed when you get the furniture into your home, you know what I am talking about. And…THIS is one of the many reasons why you should #HireADesigner. Designers go to markets to see the quality in person so they can discern for you whether or not a particular item is worth your investment, and whether or not it is the best in its category for your needs and budget. By the way, I wrote a blog post for my wonderful past client, Leslie Hendrix Wood, owner of the Hadley Court blog, on all the ways hiring an interior designer saves you money, in case you’d like to read it, here. ON ANOTHER , SAVOUR PARTNERSHIP BUSINESS RELATED, NOTE…. As with all markets I attend, I am also there on behalf of my business, and a truly joyful business moment came with the publication of Issue 5 of the new consumer focused luxury lifestyle magazine my business partner, Sam Henderson and I, are producing for one of our clients, #HPMkt exhibitor, Seasonal Living Trading Company. Gary Pettitt, the CEO of manufacturer, Seasonal Living Trading Company, is the publisher of the magazine and we are so excited for its growth. His retailer and designer partners just loved this issue and all the print copies he had printed for market were gone by the time he left. Here is a picture of the magazine I took on his ETNA volcanic stone cocktail table. In this latest issue, we were happy to feature the work of Savannah’s ReThink Design Studio, the work of Southern landscape designer, Blair Michener and to have Emily McCarthy, the owner of Savannah’s Emily McCarthy Shoppe, as our guest contributor. Emily provided Seasonal Living Magazine’s readers with the best insider travel tips on where to eat, where to stay and what to see while they’re in Savannah. Don’t miss it if you’re planning a trip there! Lastly, I want to thank Robert Maricich, the Chairman of the Board of International Market Centers, for taking a moment to say hello to me while I was there, and offering to hold a copy of Seasonal Living Magazine while I snapped his picture. Bob has always been such an amazing supporter of women in our industry, (especially of http://withit.org) and of mine, and I cannot tell you all how much I appreciated this. Bob: if you happen to see this: thank you so much and congratulations on another outstanding market for your exhibitors, your buyers and those of us, like me, who attend as service providers and press. If any of you reading/seeing this are interested in having us produce a beautiful digital lifestyle publication for your brand, that helps generate 24/7 income from your website, whether you are a manufacturer, tradeshow, retailer or interior designer, please reach out to me at leslie@savourpartnership.com. We are blessed to work with the very best in the country, all of whom understand how to use the tools of online marketing and social media to benefit your brand. As for my own travels, my next stop is the Napa Valley in California, where I will soon be speaking to an elite group of interior designers as part of a luxury brand experience being produced by my friend, Veronika Eagleson, the CEO of Modenus and Design Hounds, for her client, SKS Appliances. Stay tuned for more about that next week. 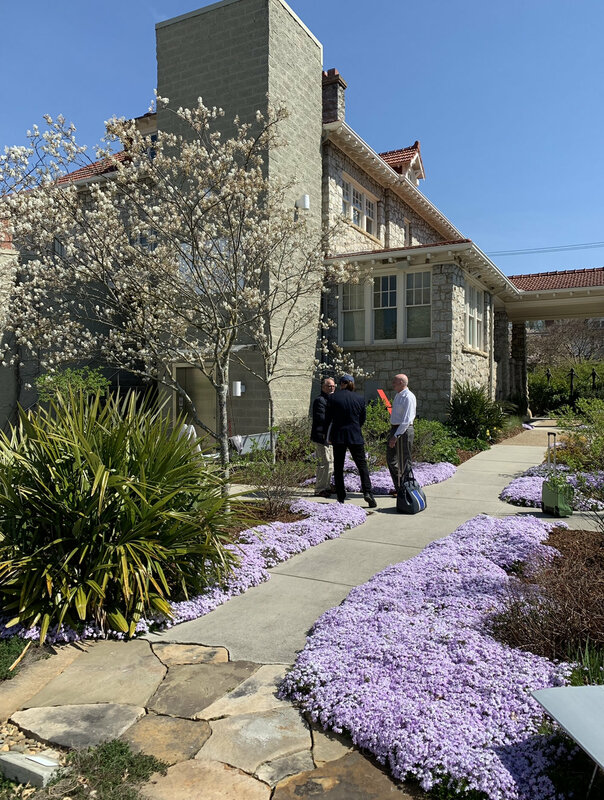 And now I leave you with an image of the most beautiful highlight of High Point Market for me, the spring garden in bloom at the Bienenstock Furniture Library , where it has been my joy to serve as a volunteer on their Board of Directors for several years now. Don’t miss what’s launching this fall, thanks to the hard work of my fellow board members, Gary Inman, Libby Langdon, and Comer Wear…..you are going to want to be a part of #FriendsofTheLibrary! Thank you, as always, for reading and for your comments. They are all so appreciated. AN EXCITING SPEAKING ENGAGEMENT IN NAPA VALLEY!